Kenya is mostly popular for being home to the - the deadliest animals of south africa like Lion, Leopard, African elephant, African buffalo, and Black Rhinoceros. Opt for Wildlife tour of Kenya, a tour package of 5 nights and 6 days that offers you a chance to indulge in animal spotting and bird watching at popular spots of the largest city of Nairobi. This well-planned itinerary takes you to the Masai Mara Game Reserve, Lake Naivasha, Lake Nakuru and SweetWaters Chimpanzee Sanctuary. Embark on your unforgettable tour of exploring Kenya. Once you arrive at the Nairobi Airport, meet our tour representative who helps you with an assisted transfer to your pre-booked hotel. Complete the check-in formalities and leave or sightseeing in Nairobi. Enjoy sumptuous dinner in the evening, overnight stay in Nairobi. After having breakfast a hotel leave for Masai Mara Game Reserve through the Great Rift Valley. This route is extremely beautiful. Locally known as the Mara, it is named so in the honor of the Maasai people, the local ancestral inhabitants. On arrival, check-in your lodge and have lunch. The afternoon is scheduled for game-viewing at the park. 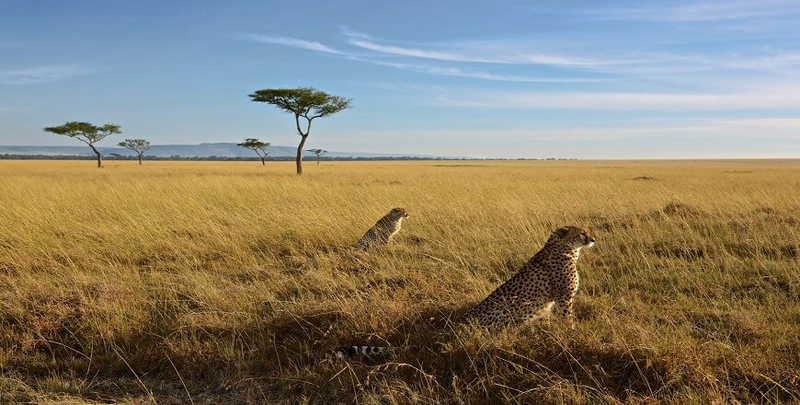 You may spot wildlife species like African elephants, leopard, cheetah, Roan antelope, wildebeests, African buffalo, jackals, and more, overnight in Masai Mara. After breakfast, full day is for game-viewing in the reserve. There are two safaris-morning and afternoon safaris. There is an opportunity to all the members of the “Big Five”: Lion, Leopard, African elephant, African buffalo, and the Black Rhinoceros, which are found here, overnight stay in the Masai Mara. Once you finish your breakfast, begin driving to Lake Naivasha. . Enjoy boat riding in the lake where you may spot Hippos. Later, proceed to Lake Nakuru to indulge in bird watching at Lake Nakuru National Park, a place full of natural beauty. The lake has a large amount of algae, which attracts flamingos in abundance. Try to spot Pink flamingos and White Rhinos here. Post lunch, proceed to the Baboon cliff to indulge in a thrilling game-drive. This is an extremely popular view point in the national park. As it is situated at a higher altitude, one can have an amazing view of the surrounding from here. Enjoy bird-spotting here pink flamingos and around 450 avifauna species, overnight in Lake Naivasha/ Lake Nakuru. Once you have your breakfast on day 5 of the tour, continue to SweetWaters. On the way halt at Nyahururu Falls, also known as Thompson’s Falls. Later, do not miss a halt at the Equator. If you want, you may click some pictures here. On reaching SweetWaters, complete the check-in formalities at the hotel. Post lunch, visit the Chimpanzee Sanctuary, established in 1993, home to endanger but intelligent animal species- Chimpanzee. Dinner followed by night stay in SweetWaters. On the last day of the tour, after breakfast, get an assisted transfer to the airport to board flight, back home.